Vulnerability is a software error which can be exploited with a security impact and gain. Many vulnerabilities allow criminals to gain control over systems and perform actions ranging from stealing sensitive information (such as credit card numbers, passwords, and personal documents) to automatic installation of viruses, Trojans, key loggers, and other types of malware. Vulnerabilities can affect all applications installed on a computer, including the operating system. The only real solution to avoid becoming a victim of a hacker exploiting vulnerabilities is to install the latest security updates that the vendor of the program has released. As new vulnerabilities are found regularly, it is important to scan for vulnerabilities on a regular basis. Not only home users, IT professionals everywhere are inclined to focus on patching Microsoft programs, operating systems and just a few other programs. Over a five year period, the share of third-party vulnerabilities has increased from 57% in 2007 to 86% in 2012. The significance of this number is that it has become more difficult for end users and administrators to keep their systems secure: If end users and organizations focus on patching their Microsoft programs and operating systems they only protect their computer and IT infrastructure from 14% of the threats posed by vulnerabilities. The Secunia Personal Software Inspector (PSI): PSI is a free computer security solution that identifies vulnerabilities in non-Microsoft (third-party) programs which can leave your PC open to attacks. Simply put, it scans software on your system and identifies programs in need of security updates to safeguard your PC against cyber criminals It then supplies your computer with the necessary software security updates to keep it safe. The Secunia PSI even automates the updates for your insecure programs, making it a lot easier for you to maintain a secure PC. PSI makes regular checks to see if a PC contains any programs that do not have the latest patches installed, and makes it easy for users to patch them. This is important since not all vendors provide scheduled updates, and they may not notify users when patched versions are released. The Secunia PSI is not a replacement for other security measures such as antivirus or personal firewalls — the Secunia PSI is designed as an essential complement to other security measures such as antivirus and personal firewalls as it helps prevent the exploitation of often overlooked exposures. Whilst anti-virus software can protect against viruses, and installation of firewalls can provide protection against some attacks by cyber criminals, individuals and businesses also need to protect themselves against the proliferation of malware and attacks by cyber criminals, which is now recognized worldwide as a major security problem. Secunia PSI provide extensive details on the software installed on a computer, it also gives you direct links to update programs that are older and potentially not secure. 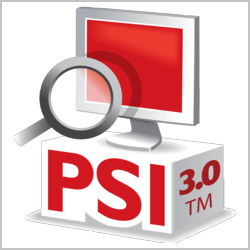 The Secunia PSI allows users to view any out of date programs installed. It also allows the user to quickly and easily upgrade to new and secure versions of applications. 2. FileHippo Update Checker: FileHippo Update Checker is extremely small in size and very easy to use. After the installation, FileHippo Update Checker will scan for installed software and send the information to FileHippo servers to compare the versions of software installed on the PC and available on FileHippo.com. It will then display a list of updates available and the download links to new updated software. One has to manually download the software and install it on the computer. FileHippo Update Checker is very good for those who want to keep an eye on everything that is being updated or installed. One drawback of FileHippo Update Checker is that it does not support all the new software being released daily but it supports majority of the popular software. FileHippo Update Checker works on all versions of Windows but it requires .NET Framework 2.0 or later to be installed. 3. CNet TechTracker: CNet TechTracker is from the owners of download.com which is considered to be a one stop destination for software downloads. Usually the updates to the software are available on CNet software catalogue sooner than other sites. Another advantage of installing CNet TechTracker is that most of the software are tested for spyware and malware before being updated. 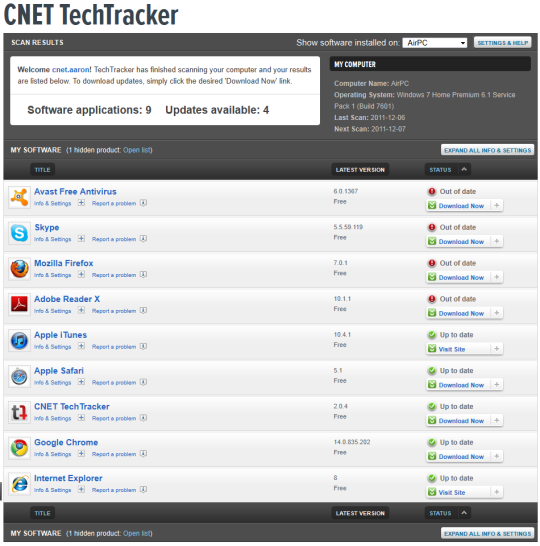 CNet TechTracker is the best tool for those who want to have a “set it and forget it” functionality. One thing to note while installing this software updater, it will also install a search toolbar which can be annoying for many users. 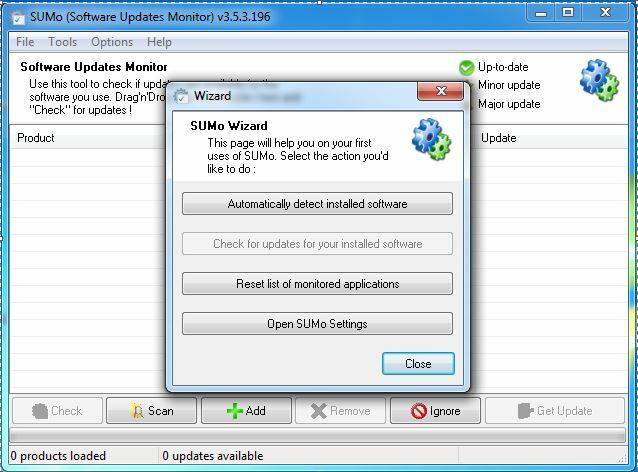 SUMo (Software Updates Monitor) is another great software updater which is easy to use and can automate the software updates process. The biggest disadvantage of SUMo is with its installation procedure. You have to be very careful while installing SUMo because it will ask you to install some useless tool-bars and software which you should always decline. Patch My PC is a small, portable and freeware application that will scan for outdated third party software and update them automatically. UpdateStar is another popular software updates client. The interface of UpdateStar is not as user friendly as other software updater discussed above. There are two editions of UpdateStar – free and premium. The premium edition is paid and is fully automated. You don’t have to touch anything in order to update the software installed in the system. UpdateStar premium will automatically update the software and let you know in the system tray. This feature is not available in the freeware edition of UpdateStar. R-Updater is a light weight software updates monitor program which does not take a lot of resources when running. It is available as an installer as well in portable edition. R-Updater starts with Windows and keeps on checking for new versions of installed software every now and then. You can also change the checking schedule in the settings. Carambis Software Updater – includes multilingual support and a very quick scanning engine with one click scanning option. Glarysoft Software Update – informs whenever a new update of a software is available. You can share information and comment on the new software updates. RadarSync – automatically download and installs new updates to installed software. Appupdater – very similar to Linux apt-get and yum and provides the automated installation and maintenance of installed software. Update Notifier – a portable software updater with a watch list feature where you can add programs to your watch list. Ketarin – Ketarin keeps the setup packages up to date instead of the installed programs. So if you have a software repository in your computer, Ketarin will keep it up to date. Software Informer – lets you find new software according to your needs while keeping the installed software up to date. FileREX Update Checker – automatically detects installed apps and then gives download links to the latest versions available. Seven Update – very much like Windows Update but it keeps third party software updated. It is free and open source. Software-UpToDate – a very simple program which notifies about the recently updated software and gives download links to those software. The good thing about these software updaters is that usually they do not conflict with each other. If you want to install multiple software updater monitoring programs, you can do it without any problems. If some one wants apt be updated with newest technologies therefore he must be expenditure a visit this network page and be up even now anniversary.